Quirky Jessi: How do I tell if I have bad breath? The Kiss-o-meter!! How do I tell if I have bad breath? The Kiss-o-meter!! Nonetheless, it's kind of a cool idea and might be cute as a gag gift. Or as a wedding gift for the newly weds who haven't quite grown to except morning breath yet. Or hey, Valentine's Day is really right around the corner, so this might be a funny gift...or gentle nudge, heh. 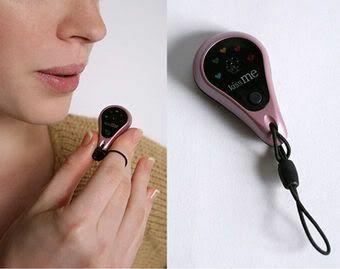 Instead, breathe into the Kiss-o-Meter, a compact "bad breath detector" with heart-shaped indicators to let you know if you're pleasant enough for smooching. Five different outcomes are possible: Kiss me, Possible, Maybe, Risky, and Never. Imported. Wipe clean.